Delving further into the SOL database, I have created a spreadsheet to show the pass rate by year of any of Richmond’s elementary schools and compare it to the division pass rate. 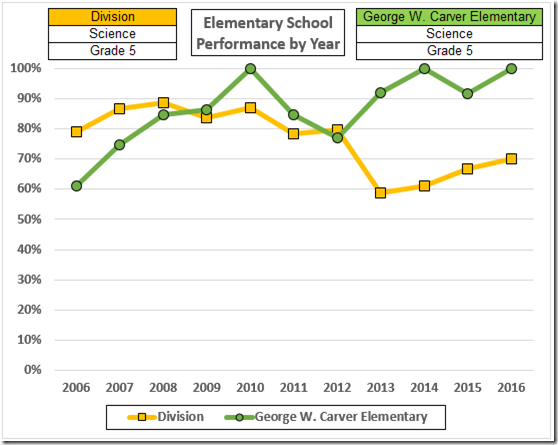 For example, here are the graphs it produced for Carver. The spreadsheet is posted on OneDrive. To look at a school that interests you, select the subject area, subject, and test level on the Division pivot table and select the school and its subject area, subject, and test level on the school pivot table. The results will appear in the table below the pivot tables and in the graph to the right. 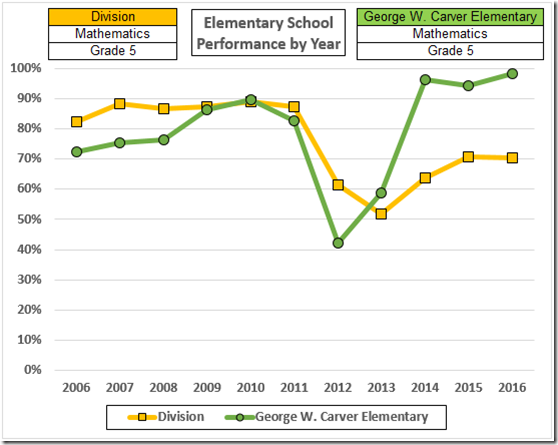 The graph output will tell you if you’ve selected something, e.g., fourth grade math, for which there are no or incomplete data. 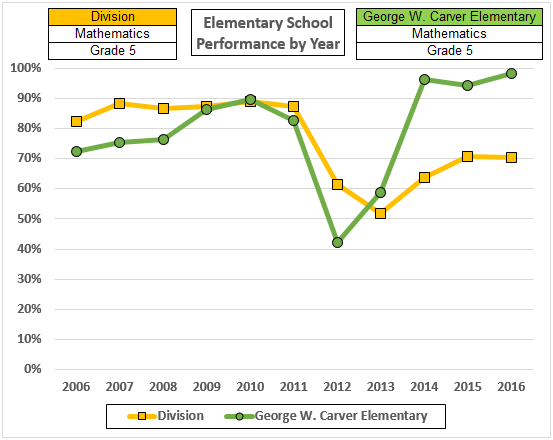 The pivot table selection box will tell you if you’ve selected two or more subjects or tests or schools by saying “(Multiple Items).” And, of course, both the pivot tables and the graph will tell you if you select different subject areas, tests, or test levels for the division and school. Are Those Carver Numbers Real? 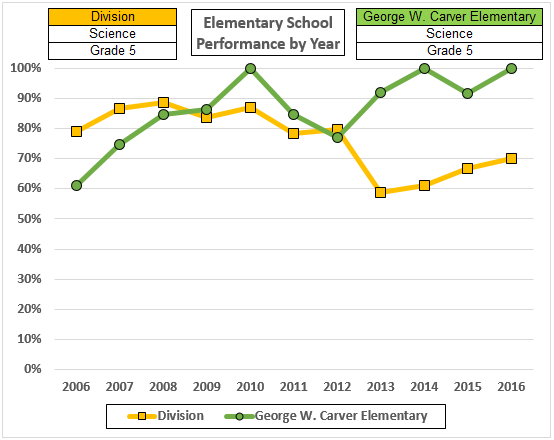 Those splendid numbers at Carver raise a troublesome question: Is that a terrific principal (she has been there since 2012) or is she running a massive cheating program? 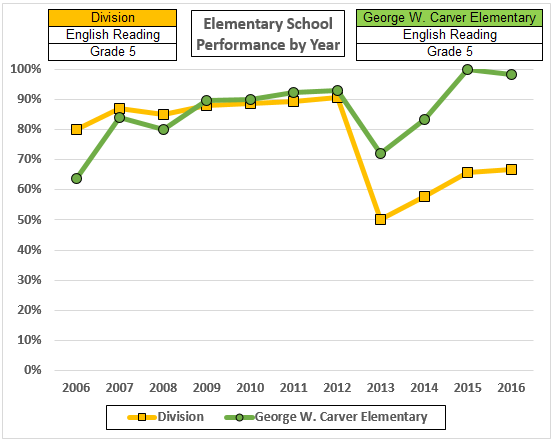 We can get an inference from these data: Notice how the 3d Grade Reading and 5th Grade Science weathered the new tests in 2013 while the other data show hits from the new tests and recoveries later. 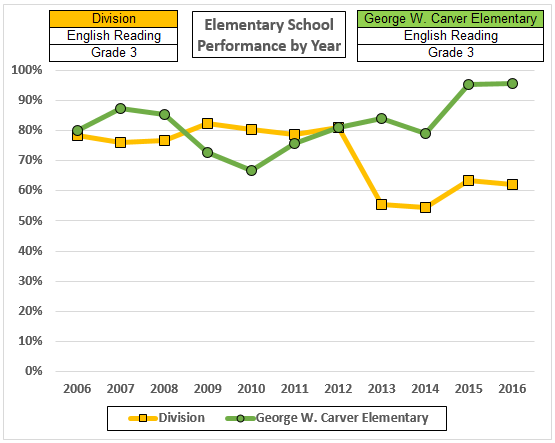 Fifth Grade Reading dropped with the new tests in ‘13 and started to recover the next year; 3d Grade Math dropped in ‘12 and took three years to bounce up; 5th grade math dropped in 12 and took 2 years to recover. This suggests outstanding leadership. A massive cheating program should have prevented all three drops or, at least, should have produced immediate recoveries. Leadership is less likely to show immediate, across the board results. Notwithstanding that happy implication of these data, the question deserves a definitive answer. Are they cheating at Carver? The matrix below shows the possible answers and, given that the Carver principal still has her job, my suggested responses for each. BTW: The answer is available from the Superintendent’s computer. 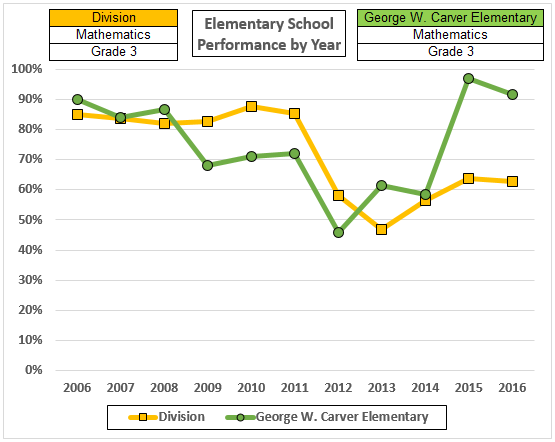 All he needs to do is compare the middle school performance in the last two years of Carver graduates with students from other elementary schools. (Hat Tip: The estimable Carol Wolf.) 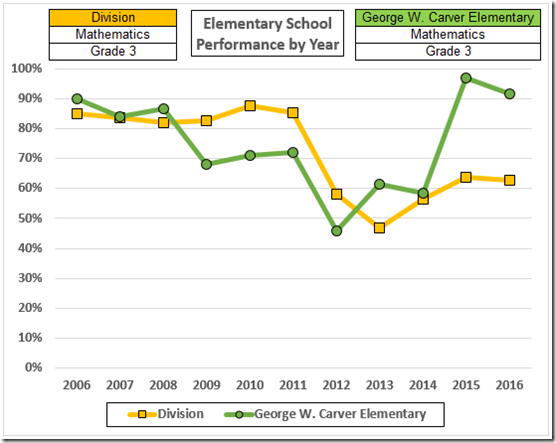 If those Carver students have been taught well, they should outperform their peers; if Carver has been a cheating factory, its graduates will underperform. 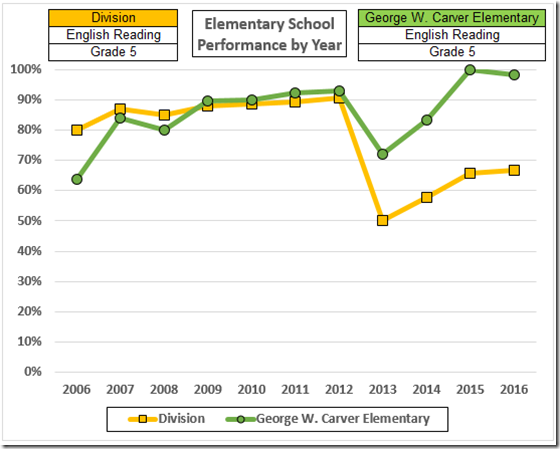 Of course, VDOE could run those data, too. But we won’t be holding our breaths: VDOE has demonstrated (several times [scroll down 2 paras. to Buchanan Co.]) that it doesn’t care about cheating so long as the numbers look good.